Presented in Predawn Gray Mica, our 2016 Toyota Camry LE Sedan is an absolute show-stopper, sporting bold sophistication and innovative design! Powered by a 2.5 Liter 4 Cylinder that offers 178hp connected to a smooth-shifting 6 Speed Automatic transmission. This Front Wheel Drive Sedan rewards you with nearly 35mpg on the open road. Solid engineering and high-grade workmanship continue to earn this car accolades every year! Every swoop and curve of our Camry LE has been masterfully crafted for optimal aerodynamics. The ergonomically designed interior of our LE features comfort tailored to you with a prominent touchscreen Entune Audio display with Bluetooth phone and a 6-speaker sound system with steering wheel mounted controls. You'll also appreciate remote keyless entry, cruise control, a rearview camera, a tilt-and-telescoping steering wheel, and split-folding rear seats. Confident handling, straightforward technology and lots of comfortable passenger space make this car an absolute delight to own. Toyota provides anti-lock brakes with brake assist, stability control, and an army of 10 airbags combine to safeguard you in this impeccable car with a sterling reputation for reliability. 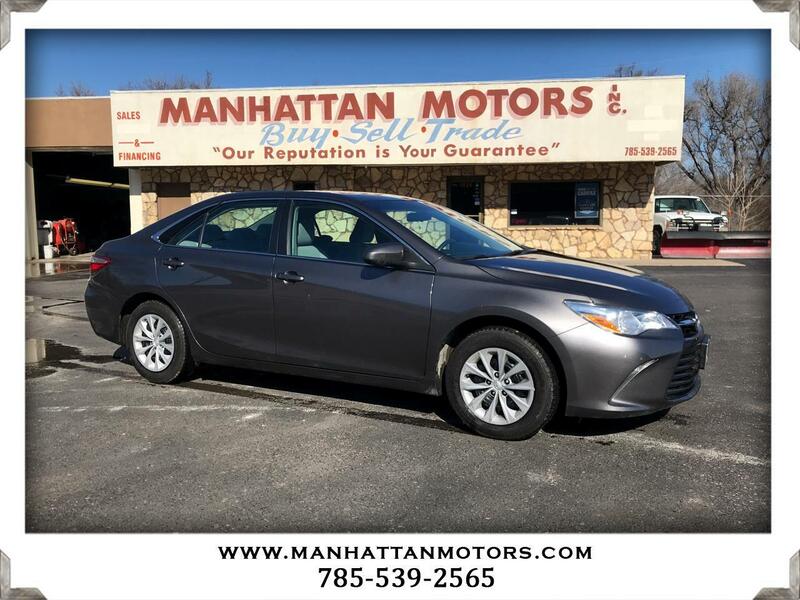 Enjoy the smooth quiet ride this Camry has to offer! Print this page and call us Now... We Know You Will Enjoy Your Test Drive Towards Ownership! Thanks for choosing Manhattan Motors. We recently won The Manhattan Mercury Readers' Choice Award for being the #1 Used Car Dealer. Buyers enjoy our "laid back" approach. No test drive routes or high-pressure salesmen. Our focus is to offer all of the information you need to help make the best decision for your family or business. Each one of our vehicles undergoes a 30-point vehicle inspection by Burnett Automotive, Manhattan's #1 Auto Service Facility. We are also the area's only Independent USAA Certified Dealer, offering discounts on purchases and interest rates.